Philippe Leclère received a Ph.D. in Physics from the University of Liège (Belgium) in 1994. 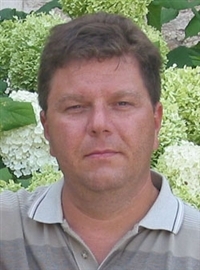 He joined the group of Jean-Luc Brédas at the University of Mons in 1995 as a research fellow. From 2000 to 2004, he worked as research associate and served as research coordinator at the Materia Nova Research Center. During this period, he spent 4 months (in 1999) in the group of Jean-Pierre Aimé at the University of Bordeaux (France) and one year (2003) in the group of E.W. (Bert) Meijer at the Eindhoven University of Technology (TU/e) in the Netherlands. Since 2003, he is still visiting scientist at the Institute of Complex Molecular Systems at TU/e. In October 2004, he became Research Associate of the Belgian National Fund for Scientific Research (FRS – FNRS) in the group of Roberto Lazzaroni at the University of Mons. In October 2014, he became Senior Research Associate of the FRS – FNRS. Characterization by means of scanning probe microscopy (SPM) techniques of the morphology and the nanoscale properties (such as electrical and mechanical properties) of organic and hybrid systems including polymer blends, nanocomposites, block copolymers, liquid crystals, and supramolecular (nano)structures (build by self-assembly of functional (macro)molecules). These systems are mainly studied for their use in organic electronics and energy harvesting devices (field effect transistors, organic light emitting diodes, (hybrid) photovoltaic solar cells, batteries, nanogenerators and (bio)sensors), in smart coatings as well as biomimetic polymer-based materials. Development and validation of novel SPM techniques (such as in situ electrochemical cell, in situ photoconductive atomic force microscopy, …) and methodologies to quantitatively determine mechanical, thermal, electrical and the “coupled” properties of polymeric and hybrid materials at the nanoscale. Supramolecular assembly of conjugated polymers: From molecular engineering to solid-state properties. Ph. Leclère, M. Surin, P. Brocorens, M. Cavallini, F. Biscarini, R. Lazzaroni, Materials Science and Engineering Reports 55 (2006) 1-56. White-Light Emitting Hydrogen-Bonded Supramolecular Copolymers based on pi-Conjugated Oligomers. R.A. Abbel, Ch. Grenier, M.J. Pouderoijen, J.W. Stouwdam, Ph. Leclère, R.P.Sijbesma, E.W. Meijer, and A.P.H.J. Schenning, Journal of the American Chemical Society 131 (2009) 833-843. Probing the Local Conformation within pi-Conjugated One-dimensional Supramolecular Stacks using Frequency Modulation Atomic Force Microscopy. B. Grévin, R. Demadrille, M. Linares, R. Lazzaroni, Ph. Leclère, Advanced Materials 21(2009) 4124–4129. Nanoscale Investigation of the Electrical Properties in Semiconductor Polymer / Carbon Nanotube Hybrid Materials. S. Desbief, N. Hergué, O. Douhéret, M. Surin, Ph. Dubois, Y. Geerts, R. Lazzaroni, and Ph. Leclère, Nanoscale 4 (2012), 2705-271. Probing viscoelastic response of soft material surfaces at the nanoscale. D.B. Haviland, A. van Eysden, D. Forchheimer, D.Platz, H.G. Kassa and Ph. Leclère, Soft Matter 12 (2016), 619-624.